Coming soon is the centenary of the two Russian Revolutions of 1917 – the February Revolution that overthrew the Tsar’s regime and the October Revolution that set aside the dithering government of Alexander Kerensky. Lenin, who had returned to Russia from exile, saw that behind Kerensky’s government was “merely a screen for the counter revolutionary Cadets and the military clique, which is in power at present.” They had to be overthrown. That is what the Petrograd Soviet did. But the Soviet Century was truncated. It lasted for just over seven decades. The Soviet Union collapsed in 1989. Its departure inflicted a heavy penalty on socialism around the world. What do we celebrate, then, when we look back at 1917? Do we marvel at the work of the tiny left-wing parties who made deep connections with the Russian working-class and sections of the peasantry in the terrible years of the Great War? In 1914, the international socialist movement crumbled before the prospect of war, with most established parties – led by the most important Marxist party, which was in Germany – voted on behalf of the war. A small minority decided that this was not a war of the people, but a war against the people, an imperialist war. At Zimmerwald, Switzerland in 1915, this anti-imperialist left gathered to regroup. From Russia came a wide spectrum of leaders, from Lenin to Martov, from Trotsky to Radek. Pacifism was not their method. “The slogan of peace is not at all revolutionary. It can only take a revolutionary character when it is linked to our argument for a revolutionary tactic, when it goes along with a call for revolution.” Lenin’s 1902 book, What is to be Done?, provided a guide to many socialists: it counseled the cadre to build organization to prepare for a change of circumstances. 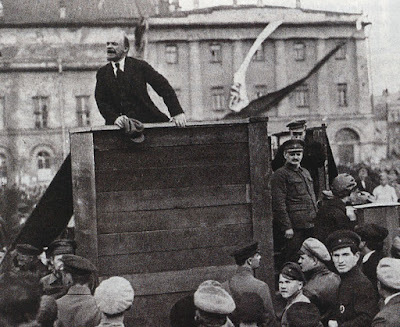 When the spontaneous strikes broke out in the St. Petersburg factories in 1896, Lenin argued, the “revolutionaries lagged behind this upsurge, both in their 'theories' and in their activity; they failed to establish a constant and continuous organization capable of leading the whole movement.” This lag had to be rectified. That the Russian revolutionaries found the means to build a network amongst the working-class and the peasantry is no small feat. In early September 1917, as workers and peasants took to their Soviets and passed resolution after resolution for their own government, Lenin wrote, “insurrection is art.” In Jack Reed’s bracing Ten Days that Shook the World, he describes the working-class and peasant energy. “Lectures, debates, speeches – in theatres, circuses, school-houses, barracks…. Meetings in the trenches at the Front, in village squares, factories…What a marvelous sight to see Putilovsky Zavod (the Putilov Factory) pour out its forty thousand to listen to Social Democrats, Socialist Revolutionaries, Anarchists, anybody, whatever they had to say, as long as they talk!” But they also seemed to want something specific – to found a Soviet Republic. It is this specific demand that led to the October Revolution. The Congress of Soldiers’ Representatives wrote to the 2nd All-Russian Congress of Soviets, “The country needs a firm and democratic authority founded on and responsible to the popular masses. We have had enough of words, rhetoric and parliamentary sleight of hand!” They demanded a second revolution. That is what the Bolsheviks, the party of Lenin, led in October. The Bolsheviks did not engineer a coup. They stayed alongside the mass upsurge and led it to fulfill its demands. Do we celebrate the incredible, but hard won, achievements of the Soviet Union from 1917 to 1989? “By creating a new, Soviet type of State,” Lenin wrote in 1918, “We solved only a small part of this difficult problem. The principle difficulty lies in the economic sphere.” To socialize production was not going to be easy. An attack by the forces opposed to the October Revolution – including most Western powers – threw the new government into disarray. The Red Army had to be organised to defend the new state, which meant resources began to be drained away from social uses. At no point during its seven decades, did the Soviet Union exist without major external threats. Its entire architecture of socialist planning was constrained by the imperatives of security. The USSR chose to push for rapid economic growth to sustain the Red Army and to provide sufficient social wealth to improve the livelihood of the population. There was consistently a worry that the use of strategies to build industrial capacity in a hurry and to increase rural productivity would lead to far too centralized a state. “Communists have become bureaucrats,” warned Lenin in 1918 in a letter to Grigori Sokolnikov, one of his closest comrades. “If anything will destroy us, it is this.” Embattled by the siege, driven by the hurry to build the physical plant and the human capacity of the country, pushed by classes adverse to their experiments, the Soviets moved to weaken democratic institutions. Their choices were few. It is in this lack of choices that some of the major institutional errors crept in for the Soviet Union. The small Bolshevik Party now renamed the Communist Party of the Soviet Union drew in three million members by 1933. It was a dynamic party, which enthused popular classes into new activity – including exciting new developments in culture, art, philosophy, technical sciences, and so on. The great advances in the imagination seemed to come from nowhere, but actually they came from the spirit of the revolution and from its instrument, the Party. When the Party began to go against the opposition, it excised the potential richness of Soviet politics and left the Party – in name – but not in spirit. Party members became apparatchiks in the bureaucracy, denuding the political life of the party for the administrative life of the state. With the Tsar’s apparatus in their European exile, it was necessary to staff the bureaucracy with every capable person – but this emptied the Party of its life. It did not help that so many vibrant Party members –Sokolnikov among them, but so too the linguist Voloshinov, the literary scholar Medvedev, the theatre director Meyerhold, the botanist Vavilov, the pianist Gayibova – were killed in the Purges. The Party suffered greatly from the loss of these talented people, either to State jobs or to the gallows. The advances, despite the setbacks, were quite incredible. Planning as a mechanism drew the admiration of capitalist state managers. It allowed the USSR to better apportion the meager resources toward rapid industrial growth. This physical plant is precisely what built the bulwark of the USSR against fascism. There is no question that Western liberalism was saved by the might of the USSR in World War II. If the USSR had not broken through as a result of War Communism, the New Economic Policy, and Stalin’s industralisation policy, then Western Europe would have been broken by decades of fascism. As it happened, Hitler’s ambitions died in the factory towns of the USSR, where the steel and mortar emerged to destroy the Wehrmacht. World War II devastated the USSR, which had to once more go onto a War Communism footing to build up its strength. The Western encirclement had once more begun. There was no respite for the Soviet Union, which had lost over twenty million people in the defense of freedom. Not enough can be said of the great sacrifices of the Soviet people in general. Tragically the fruit of their sacrifice was seized by liberalism and not by Communism. One of the major limitations of the USSR was that it did not enhance the democratic aspirations of the people. In fact, by restriction of democracy, it allowed the West – only formally democratic – to claim the mantle of democracy. Friedrich Engels wrote of the February 1848 uprising, “Our age, the age of democracy, is breaking.” He described the scene in the French Chamber of Deputies, when a worker rushed in with a pistol in hand. “No more deputies,” he shouted, “We are the masters.” It was not to be in 1848. But this is the seam in communism that is irrepressible –the desire for participation and leadership. In October 1917, Lenin addressed this possibility directly. “We are not utopians,” he wrote. “We know than an unskilled labourer or a cook cannot immediately get on with a job of state administration.” The key word here is “immediately.” Training is essential, Lenin wrote, and once trained, every cook can govern. “Our revolution will be invincible,” he continued, “if it is not afraid of itself, if it transfers power to the proletariat.” That transfer of power did not effectively happen – although the Supreme Soviet was much more representative of the working-class and peasantry than in any liberal democracy, and its leadership came from solid working-class (Brezhnev) and peasant (Khrushchev) backgrounds. The full promise of Communism could not, however, be met in the constraints of the USSR. The lack of effective democracy meant that there became a tendency to bureaucracy and to stagnation – bolstered by the diversion of an enormous amount of the social surplus to the security establishment. Attempts at reform of the system – such as Kosygin’s 1965, 1973 and 1979 reforms – would be ill starred. These were top-down initiatives. They did not emerge from the depths of the party and of the population. It was a similar top-down attempt in the 1980s led by Gorbachev that led to the liquidation of the USSR. Gorbachev went for openness (Glasnost) and economic restructuring (perestroika), introducing these Russian words into English. Similar policies had been pushed in China around this time, and much of what he had attempted was in the framework of Kosygin’s various attempts at reform. What Gorbachev did most dramatically – and which is not enshrined as a crossover word – was to insist on multiparty elections and to essentially frontally attack the role of the Communist Party in the USSR. The was demokratizatsiya, which essentially dismantled the state institutions and left them prey to the opportunistic party apparatchiks and private businessmen who became the first Russian oligarchs – those men fed on the social wealth produced by the Soviet people. The precipitous break-up of the state allowed unscrupulous politicians such as Boris Yeltsin (along with his intellectual cronies Anatoly Chubais and Yegor Gaidar) to drive the USSR off the cliff. In fact, what is often not raised in this connection, is that Yeltsin, with the support of General Pavel Grachev, conducted a coup d’etat against the USSR in October 1993. This was the October Counter-Revolution. More than a quarter of a century has passed since the USSR collapsed. Many of the problems experienced by the Left – the decline of the political fronts of the global working-class and peasantry – predate the fall of the USSR. The Third World debt crisis, the new technological innovations such as container ships, satellite technology and computers, reasonably low fuel prices and the new intellectual property regime allowed for the creation of the global commodity chain. Commodities now travel this circuit outside the territorial sovereignty of states – which means that not only do states not have power over their economies, but unions in the factories and fields are much harder to organise. The basis of Communism – the organised working-class and peasantry – was much weakened from the 1980s onward. The fall of the USSR politically expedited the ability of the imperialist states to enhance their position in this new phase of capital. No alternative bloc remained to withstand the dynamic of capitalism. Those haunting lines from the Communist Manifesto (1848) linger, “The cheap prices of commodities are the heavy artillery with which [the bourgeoisie] batters down all Chinese walls, with which it forces the barbarians’ intensely obstinate hatred of foreigners to capitulate. It compels all nations, on pain of extinction, to adopt the bourgeois mode of production.” The phrase “on pain of extinction” is resonant of the violence of the process. Even the adoption of the bourgeois mode of production is slight – it is enough to formally become attached to the ravenous desires for capital to accumulate, not to really subsume social relations to those of the right of workers to sell their labour power (slavery and debt peonage remain alive and well in the maquiladoras of Mexico to the slum factories in Bangladesh). The USSR as a bulwark is no longer available. Even less the USSR as the provider of support – as well in the bleak Brezhnev years – for guerrilla movements in southern Africa and central America. Western unipolarity (with the US in the lead) began to define the world system. Nostalgia is not the mode with which to look back to the USSR. It is important to see it for what it was able to provide human history – an alternative to capitalism, a defense against fascism, an experiment – with failures – of the construction of socialism and socialist democracy. There is a great deal to learn from the USSR, a great deal to admire and a great deal to censure. Communism is not a system that will emerge easily out of our present. All the maladies of our human history will sneak into these new experiments. Vigilance is necessary, as is creativity. The Peruvian Marxist Jose Carlos Mariategui (1894-1930) wrote that Communism “must be a heroic creation.” It does not emerge full blown. It has to be fought for, its errors understood, and its achievements digested. Communism, Mariategui wrote, “is formed in the class struggle, carried out with a heroic spirit and passionate will.” There are human beings here. Nothing is perfect. The essence of Communism is to strive to break away from guaranteed suffering to a new epoch that shall bring its own challenges. Vijay Prashad is the Chief Editor at LeftWord Books. His most recent book is No Free Left: The Futures of Indian Communism (2015). Brilliant summary and analysis Vijay, as always. I hope Vijay is correct. In any case, the experiment must continue; either that or it's goodbye to us all.